Taste test: This 1.5 oz. bag was mostly air, after I opened the bag it looked like it was half empty before I even grabbed the first chip. Ugh. The chips themselves had a lot of barbecue powder on them, but not much on the barbecue taste side of things. 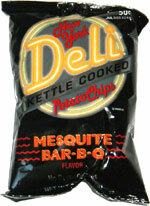 The kettle-style makes the chips crunchy, but I'd probably go with another variety if I was a true barbecue chip gourmet. 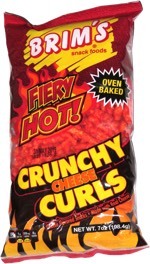 Smell test: A slight barbecue aroma from the bag. Trivia: Claims to be "the best of New York in a bag." This snack was discovered by Keith at Belly Delly Deli, on Broadway between 49th and 50th, Manhattan. Review published .